El Tecolote Parque Ecoturístico is a large pine forest only four kilometers east of Mazamitla, a delightful place where you can relax and enjoy nature. Somehow I managed to convince anthropologist Susan Street that I had really found a way to go camping during Holy Week and she agreed to join the expedition (most likely in order to analyze the bunch of us). Off we drove to Atoyac on Friday morning only to run into a procession blocking our way. We soon found out the procession was actually a Via Crucis, which would last for many hours, and that the street which had been commandeered for the event was also the one and only road leading to Hugo’s cabin ... a mere ten kilometers from town. “CEO never gives up!” said my friends and off we marched to the town plaza to seek a second opinion about our plight. A few minutes later, we found ourselves on a dusty red-earth brecha. We kept bearing east until we came to a big family reunion picnic (plus bath) next to an irrigation ditch. “Cómo que qué?” the picnickers said. “You’re going entirely the wrong way” and kindly drew us a map in the powdery dirt, assuring us this would lead to a blacktop road which would then take us to Hugo’s cabin. Ten minutes later, we arrived among another crowd of picnickers who sent us back the way we had come with a new scratched-in-the-dust route guaranteed to take us right to the highway we wanted. Several hours and rustic route rewrites later, we came to the asphalt road. “You see, Susan,” I commented, “CEO never gives up.” Now we were zooming along – just fast enough to avoid the many baches (potholes) in our new-found road, but, curiously, my GPS indicated that we were going exactly in the opposite direction of the cabin, which was now 15 kilometers away. Dozens of kilometers later, a road sign appeared announcing that we would soon reach Tuxcueca. But when we reached the turnoff our compañeros kept going straight. Yet another phone call. The restaurant owner-friend then chimed in: “Actually, there’s a great place near here called El Tecolote (The Owl), where you can camp or rent a cabin ... but who knows what it’s like during Semana Santa? 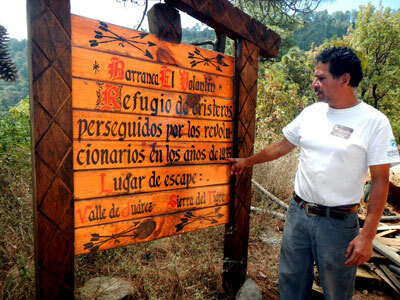 We headed for the entrance to El Tecolote, having traveled a grand total of 95 kilometers to get there from Atoyac. Here we asked the manager, Luis Oceguera for a camping spot as far away as possible from the music. That comment, of course, knocked me right over. After Mario had revived me with smelling salts, we proceeded along a well-kept dirt track (fine for any sort of vehicle) through lofty pine trees to a charming glade not far from some good-looking cabins and public toilets. There was only one tent there, whose owners, two young ladies, welcomed us. As promised, it was so quiet you could hear the birds twitter (for those of you who remember what that word used to mean). We pitched our tents and, as dusk arrived, so did four mysterious visitors. Biologist Isaac Terrones also mentioned that a brand new species of tarantula had been found here. “It will be called Cotztetlana mazamitlencis,” he said proudly. That certainly piqued our curiosity and the next day we enjoyed following a gently sloping trail (with rustic railings) which dropped 200 meters into a different ecosystem where cool, delicious and perfectly drinkable water springs from the ground all year round. Most fascinating for me was a tree with very soft leaves overhanging the trail. “Western Yellow Bats (Lasiurus xanthinus) live in these trees because they love the softness of the leaves. We’ve had to move them away from the path several times so they won’t get hurt,” commented our guide, Oscar “Chino” Rodríguez. El Tecolote is open 9 a.m. to 7 p.m. for day visitors and charges 20 pesos per person. The road can be negotiated by any sort of car and is good even in the rainy season. You can pitch your own tent or camp in an unfurnished mini-cabin on a platform for 150 pesos. There are also big furnished cabins with five bedrooms, housing 20 people and costing 3,000 pesos a night. “If you come on a weekday, we can negotiate the price,” says Luis Oceguera, who speaks some English. For more information, call Luis’s cellphone (331-092-5012) or home (382-538-0897). From Guadalajara, take Highway 54 toward Colima for 12 kilometers and turn off onto Highway 15. After 20 kilometers, follow the Jiquilpan sign and keep going another 33 kilometers to the Mazamitla turnoff, just past Tuxcueca. Now go uphill 41 kilometers southeast to Mazamitla. Upon arriving at the Mazamitla Pemex Station, head for the entrance to El Tecolote, which lies 1.7 kilometers southeast of you at N19 54 45.9 W103 00 17.7. From this point on there are plenty of signs directing you to the cabin/campsite area at N19 54 43.6 W102 59 05.4. If you have a GPS or smartphone, you can just follow the Wikiloc.com route called El Tecolote Parque Ecoturistica.